Imagine privacy combined with assistance in the activities of daily living anytime you need it, plus a rich community life. In the assisted living community at Walnut Place, you’ll not only receive the right level of care to improve your quality of life, but you’ll also enjoy scheduled trips, shopping, arts and crafts, and other social activities. It’s a combination that encourages assisted living residents to keep their independence and remain as active as they’d like. Walnut Place has a long-standing reputation in the North Dallas area, but we don’t let it stop pushing us to be better. Our assisted living community fosters an atmosphere of fellowship, camaraderie and genuine connections. Aside from our reputation, this is what truly sets us apart. At Walnut Place, our assisted living community provides support with medication management, bathing and dressing. Naturally, housekeeping and laundry services are provided, and dining is a daily pleasure with a changing menu of nutritious, delicious selections in welcoming dining rooms conveniently located on each floor. Additionally, all of our spacious assisted living apartments are pet-friendly so you can bring your furry friend with you! At Walnut Place, meal services are prepared under the direction of the Culinary Chef who trained at the Culinary Institute of America Masterworks and won the Iron Chef DFW region for Compass Group. Residents enjoy personal menu selections on a daily basis. Special diets, as required, are routinely provided. Being situated close to Texas Health Presbyterian Hospital is one obvious reason people may think to choose Walnut Place. But, once people see our residential amenities, they realize our location is only a small piece of why people choose our assisted living community. Our private assisted living residences are available in a variety of sizes—from efficiencies to two bedrooms. Each is complete with a kitchenette, private bath and living area. At Walnut Place you can be confident knowing that you or your loved will be cared for by our dedicating team. 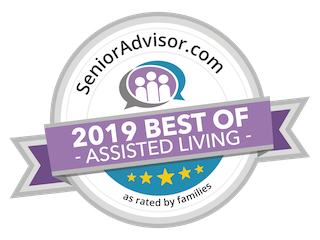 Thanks to our residents and their families for sharing their kind words and positive reviews on SeniorAdvisor.com, Walnut Place has earned the 2019 Assisted Living Award from SeniorAdvisor.com. Friends and family may visit Walnut Place senior living community near Lake Highlands anytime, and parking is always free! We invite you to visit our vibrant community today or contact us for more information on our assisted living services! Need a break from caregiving? Walnut Place gives caregivers temporary relief through reliable respite care for individuals who can no longer live alone, but don’t require full-time nursing care. Simply contact us to ask about our assisted living respite care services. Within the assisted living community at Walnut Place, your loved one will enjoy a furnished residence—with assistance anytime it’s needed. Caring, Respectful Assistance: Our professional staff is always at hand to provide kind, gentle assistance with the activities of daily living. Fine, Casual Dining: With delicious and nutritious meals prepared on-site, you can be confident your loved one will find dining a treat at Walnut Place. Planned Events and Activities: Your loved one will have opportunities to take part in engaging activities with our full-time Walnut Place residents. With our Health & Wellness Navigation program, a trained wellness Navigation team partners with residents to anticipate resident needs and address them—from day-to-day nutrition, fitness and life-enriching activities to preparation and follow-up for hospital care. The team coordinates with resources as needed to ensure peace of mind and confidence for the future. Click here and learn more. The NICHE (Nurses Improving Care for Healthsystem Elders) designation indicates an organization’s commitment to elder care excellence. As a participant in this program, Walnut Place is able to offer evidence-based, interdisciplinary approaches that promote better outcomes, positive experiences, and improved care for older adults. This leads to greater satisfaction rates for patients, their families and staff.